On her way to a medical appointment in Bergen, wheelchair bound former police officer Hanne Wilhelmsen is injured when the train she is travelling in is derailed during one of the worst blizzards in Norwegian history. She passed out when a piece of metal is impaled in her thigh and when she comes round finds herself with the other passengers in Finse 1222, a hotel so called because of its height above sea level. All they can do is sit out the storm and wait to be rescued once the conditions allow it but for the moment everyone is trapped inside the hotel. Hanne’s fellow passengers are a motley bunch: among them a group of youngsters on a trip, a Kurdish couple, a couple of businessmen, an outspoken right-wing television presenter, several clergymen and a delinquent teenager. Rumours start to circulate about the final carriage of the train which several of the passengers claim was sealed. Then a guest notices an armed security man guarding one of the apartments on the top floor of the hotel and speculation starts to mount that members of the Norwegian royal family were also on the train. Not knowing how long help will take to arrive, the passengers try to make the best of things but tempers soon start to fray and when, the following morning, the body of one of the priests, apparently killed by a gunshot, is found outside the doorway of the hotel, panic starts to set in. It falls to Hanne reluctantly to try to investigate the murder and the events that follow. 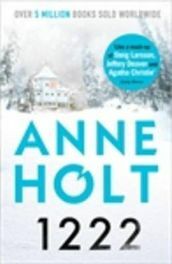 Anne Holt’s 1222 is a modern take on the Agatha Christie ‘locked room’ novel with a long cast list and a steadily rising body count. This works well with the confined setting and the uncertainty over when help might arrive adds to the tension. The diversity of the passengers also stirs things up a bit even if the choice is rather contrived. The range of characters may reflect a typical train journey but with so many it’s impossible to do much in the way of character development and the result is confusing. This is the first of Anne Holt’s novels to be translated into English although she has been successfully translated into German and Swedish among other languages. Clearly the publishers thought it was time to cash in on the popularity of Scandinavian crime fiction and Holt is incredibly successful in her home country. The problem with ‘1222’ is that Hanne is already a well developed character with what appears to be a complex back story that competes with the murder mystery element of the novel in a distracting way: it’s probably not the best novel to have been first up for translation. That aside Hanne Wilhelmsen is a cracking character; acerbic and anti-social yet wholly compelling and gloriously perceptive. A wheelchair bound, lesbian former detective could easily have come from the pen of Janet Evanovich or Sara Paretsky but Holt avoids turning Hanne into a caricature. Paralysed by a bullet in the denouement of a major corruption case, Hanne has lived virtually reclusively of late and it takes some coaxing to persuade her to look into the murder. It’s interesting to see Hanne’s transformation as she slowly regains the curiosity that made her such a good policewoman. The story unravels slightly because of the lack of focus. The mystery of the top floor occupants is an unnecessary diversion while the lack of character development of everyone but Hanne fails to provide any meaty suspects. The climax is thoroughly absorbing and Hanne’s Poirot-esque conclusion is really entertaining but I didn’t feel like I could have picked up on any useful clues along the way: in fact, until the conclusion, the narration is one dimensional, seen only from Hanne’s point of view and there’s nothing to suggest whether, or not, Hanne is a reliable narrator. Nothing happens that does not directly include Hanne, or that is not reported to her but, at the same time, she holds her cards close to her chest and it’s impossible for the reader to know what she’s thinking when it most matters. Rather too much focus is placed on Hanne’s history but this did persuade me that it would be worth back tracking as Corvus gradually makes the back catalogue available in translation. While it’s not wholly successful 1222 is not a bad read though it’s one that works better for atmosphere than for the mechanics of plot. Personally I love snow bound settings and this one failed to disappoint. Recommended with reservations.